Dr. Robert Nabanyumya announced as the new Chairperson, Ms. Regina Namakula as the new Publicity Secretary and Hon. John Arimpa Kigyagi as a Committee Member. 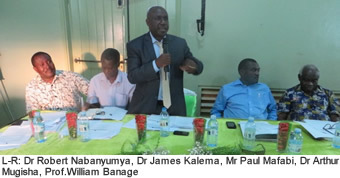 NatureUganda held its 23rd AGM on Thursday 9th 2015 at their Historical venue, the Uganda Museum. This was also the 3rd AGM following the amendment of the NU constitution. This AGM was a big milestone in the history of the organization as it marked the changing of the Chairman of the Executive Committee after more than 10 years of service. As is the custom of the organisation, this AGM was marked with presentations of reports from the outgoing chairman; Mr. Paul Mafabi, the Treasurer; Dr Robert Nabanyumya and the Executive Director NU; Mr. Achilles Byaruhanga in relation to the operations and performance of the organisation in the past year and the outlook for the year ahead. Among the key points of discussion from these reports was the continued low rate of renewals for the NU members. In reaction to this, NU was tasked to increase its renewal drives even if it means investing more resources into this. In addition, every member was tasked to recruit at least five members as a take home exercise. After the discussions, elections were held following the end of term of service for the Chairman, Publicity secretary as well as one committee member as per the NU constitution. From the results of the elections, Dr. Robert Nabanyumya was elected as the new Chairperson, Ms. Regina Namakula as the Publicity Secretary and Hon. John Arimpa Kigyagi as a Committee Member. The new auditors for NU were also elected and JP Magson Certified Public Accountants Uganda was appointed as the new auditors. If you notice, the position of Treasurer fell vacant after he was elected as Chairperson. The constitution states that “In the event of any other post falling vacant or temporary absence, the Executive Committee shall elect from within its members one to act until the next General Meeting or until the return of the Office Bearer in question”. Based on this, it was agreed that the committee elects a treasurer from within the Executive Committee to act until the next AGM. The incoming Chairman Dr. Robert Nabanyumya said he was honoured to take the reign for the next three years. "I'm truly humbled to have been elected to such an important position and call upon members to continue supporting NatureUganda in its endavours to promote the understanding, appreciation and conservation of Nature," he said. NatureUganda would like to applaud and appreciate the outgoing Chairperson, for the dedication and wonderful work done to steer NatureUganda for the last 18 years. We wish you all the best in all the endeavours that await your leadership and stewardship. NU also thanks all its members for their continued support, enthusiasm and dedication to conservation in Uganda.